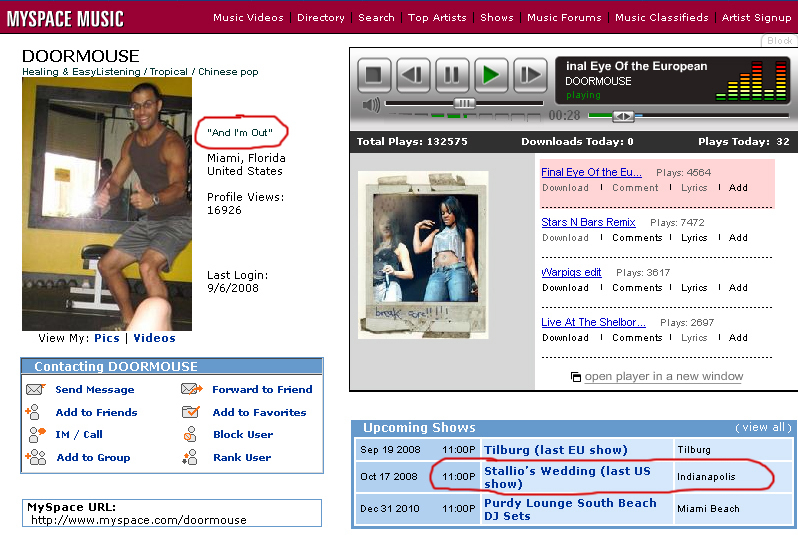 on doormouse's myspace calendar, he has my wedding show listed as his last US show. ("purdy lounge dj sets" is a weekly recurring event that may very well end before october 17.) furthermore, his myspace "headline"—which is more of a profile quote or signature than a headline—now reads "And I'm Out". all of this suggests that doormouse is retiring from music (or at least live performance). if true, it means that the october 17 doormouse show in indianapolis could be his final live show ever! of course, it's my wedding night—we're getting married earlier in the day—so this show was always going to be special for me. but if it's going to be doormouse's last show ever... wow. 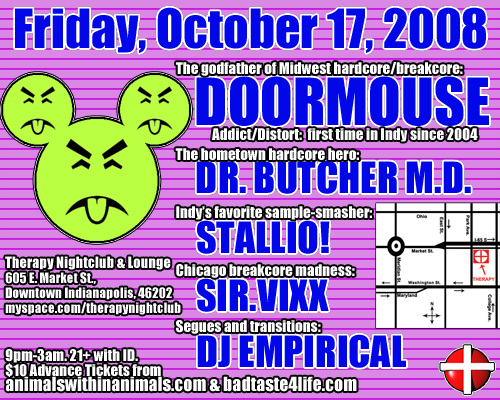 here are myspace links for the performers: Doormouse, Dr. Butcher M.D., Sir.Vixx, DJ Empirical. if you want a taste of what my set will sound like, download my mash smarter not harder EP. another thing we've learned recently is that gary thinks sarah palin is the bestest VP candidate ever. so what happens when an unstoppable force meets and immovable object? what happens when the enquirer takes on sarah palin? Republican Vice Presidential nominee Sarah Palin attempted to quietly have her daughter Bristol get married before news of her pregnancy leaked out, the NATIONAL ENQUIRER is reporting exclusively in its new issue. Palin planned for the wedding to take place right after the Republican National Convention and then she was going to announce the pregnancy. But Bristol, 17, refused to go along with the plan and that sparked a mother-daughter showdown over the failed coverup. The ultra-conservative governor's announcement about her daughter's pregnancy came hours after The ENQUIRER informed her representatives and family members of Levi Johnston, the father of Bristol's child, that we were aware of the pregnancy and were going to break the news. personally, i don't trust the enquirer's reporting any further than i could throw it. i start out with the assumption that this junk is false. but apparently, gary really believes in this stuff. he starts out with the assumption that it's true. he thinks of the national enquirer as a respectable journalistic institution that follows the tough stories that other outlets are too timid to touch. so how will he react? my metaphorical money is on him not mentioning it at all. this will be interesting to watch. i'm back, with new backgrounds inspired by (read: promoting) the upcoming wedding show. schizophrenia 3 was excellent; the abelcain set alone was worth the price of admission. rib america was not so great. the food was delicious but vastly overpriced, and it was crazy hot outside. plus, there was an hourlong break in between bands, and we realized we had nothing to do during that time. (i guess we could've bought more expensive food or gotten some free samples of chewing tobacco, but that was about it.) so we went home before blue oyster cult even played. i heard about mccain's odd choice of vp before i left, but didn't hear about her various scandals until i got back. i did hear plenty about hurricane gustav, as we watched a lot of tv in the hotel room.